Roger Thurow – One Billion Hungry: Can We Feed the World? So often discussions around agriculture and food security focus on all or nothings: small farms or large-scale industrial farming, organic or conventional agriculture, public sector support or private sector investment. In December 2012, Oxfam asked agricultural experts, champions, farmers and knowledgeable individuals from the field to the United Nations to take part in a two week online discussion about how we can meet the world’s growing need for food in a sustainable and equitable manner. The aim was to move past the disagreements and discourse and to imagine a positive actionable future for agriculture. What if all farmers had adequate risk management systems to deal with climate trends and shocks, as well as with price volatility in input and product markets? What if fossil fuels were no longer required in any form of input to global agricultural production? What if all farmers, male and female, had full and equal control over the necessary resources for farming, and over the outputs of their labour? What if the ideas and innovations of resource-poor farmers leading to improvements of their natural resource base were supported by adequate access to public and private sector investments? The results of these discussions and the 23 essays, have now been published in a report, entitled The Future of Agriculture. There was general agreement that we need to foster creativity and innovation. That while we possess some of the technologies and practices to achieve a more sustainable and equitable agriculture, we will need to test the limits of human creativity and idealism to meet future challenges. 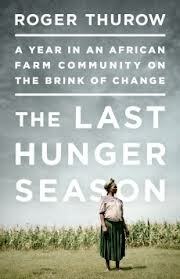 This is a quote taken from Roger Thurow’s book, The Last Hunger Season, one of our favourite books from 2012. It is a record of the lives of four farmers in western Kenya over the course of one year, encompassing both hunger and harvest. The book documents the hardships these farmers face and provides an insight into their lives. While one person can never fully understand the life of another, we do all aspire to the same things: health, wealth, happiness and security.